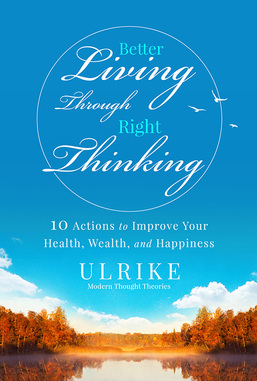 "Better Living through Right Thinking, 10 Actions to improve your Health, Wealth and Happiness"
“Better Living through Right Thinking – 10 Actions to improve your Health, Wealth, and Happiness” by ULRIKE, explains how to attain the universal goal of happiness through mental house cleaning, rigorous, positive thought modifications, and a new and improved mind-model. PALM SPRINGS, Calif. –ULRIKE’s perception of life and the universe changed drastically after studying metaphysics for over three decades. In her fifth book “Better Living through Right Thinking – 10 Actions to improve your Health, Wealth, and Happiness”, (ISBN 9781628653403), she communicates in detail how our thought process works and attracts the things we focus most on. “Better Living through Right Thinking – 10 Actions to improve your Health, Wealth, and Happiness” stresses that other wonderful things will naturally come our way, once we have mastered our new attitudes and start improving and healing our lives. “Forever…and 365 Days” by Ulrike, Modern Thought Theories, published by Troll River Publishing, chronicles the life of an inspirational metaphysics teacher and writer for a full year. The text promotes the application of right thinking, and to find happiness through a rigorous mental house cleaning and specific thought modifications. HOLLYWOOD, Calif. –Ulrike’s perception of life and the universe changed drastically after studying metaphysics for nearly three decades. In her fourth book, “Forever…and 365 Days” (ISBN 978-1-939564-26-9), she continues her journey of soul searching, and teaching what she has learned in her sincere quest to live a better life, and share this knowledge with her beloved readers. ‘Forever…and 365 Days’ stresses that love, not emotion, is the key to our transformation from caterpillar to butterfly. Love is the motivating principle of all things and love is the mother of our being. This book explores the return to this source of all bliss, the attainment of perfect health, wealth and happiness - now and ‘Forever…and 365 days’. Born in Salzburg, Austria, ULRIKE began a career in Entertainment Events in 1992 at a major Hollywood Studio, a position that would span nearly 20 years in the world of motion pictures and television. During this period, she continued her intense studies, teaching and writing about her passion - her metaphysical findings. In 2011 ULRIKE decided to pursue her path as an inspirational author/writer and metaphysics teacher full time, guiding her students through private classes and workshops. With her concept of right thinking, under the name “Modern Thought Theories”, and her books “…because you can”, “Inspire your Day!”, “The Seeds Will Sprout Somewhere”, and her newest work “Forever…and 365 Days”, she is reaching out to students en masse who are also searching for more meaning in their lives, exposing them to the power of right thinking and the application thereof. "Better Living Through Right Thinking, 10 Actions to improve your Health, Wealth and Happiness", scheduled for publication October 2016. To order your hardcover copy please click on this link! Is it right or is it wrong? Is it good or is it damaging? Why do we have to ask ourselves these questions all the time? We have double standards. We believe that evil is real. We believe that something can harm us. The truth is, however, that we are perfect beings of light, indestructible and pure. We have only fallen into the mist of misunderstanding and are acting according to our fears. It is a life time task to sort out these wrong beliefs and teachings. We have to reeducate and retrain ourselves to think and act correctly. It is a daily task. Minute by minute we must be aware of our actions and make certain that love is our motive in everything we do. Introduction to ULRIKE's new work "Forever...and 365 days"
Last year, when I was just about ready to send the manuscript of my first book “…because you can!” to the publisher, I realized I had so much more to say. I love the daily discipline of writing, and even though I produce articles for magazines, and quotes, and healing thoughts for my social media on a regular basis, I am always urged to write more by the higher self. It dawned on me over New Year’s Day that this was the opportunity to chronicle the unfoldment of a searcher’s mind - my own - over the course of a full year. As a New Age teacher constantly searching for more enlightenment, it occurred to me that my own thoughts, my own challenges and solutions, my own applications of Truth and my own searching for more Understanding, would be of benefit not only to myself, but also help many others who are ready to tackle their own understanding of life and what it means to them. This was my concept in writing this book. Life lives and will go on forever, but we are still dealing with 365 days a year with our human experiences, whether it be the joys and rewards of a life well spent, or challenges and tribulations from issues that arise day to day. We are still here - right now. This book is a compilation of my thoughts and my daily diligent mental applications. They are my experiences, proving over and over again that thought is causative. You will see the daily chapters at times jumping from one subject to another, but this is how my mind assimilated new ideas and has looked at fresh concepts. Being an avid reader, I have incorporated my findings after studying the texts of other metaphysical authorities, and it reflects the conclusions I came to and the mental growth I experienced. Students, readers and strangers alike, have contributed their real life stories to make this a living document. It is a vivid picture of what happens to all of us in this stage of unfoldment. Characters and their woes in need of improvement, personal tests, and many valid inquiries are portrayed as practical as possible. I’m sure many of you may relate to more than one chapter and see your own life’s reflection and experiences in the stories I have shared. You are the ‘light that shines for all eternity’…so make it the best 365 days you can, this year and every year, as long as you shall live on this plane!